Today my daughter and I felt like going to a museum and looking at some beautiful things. 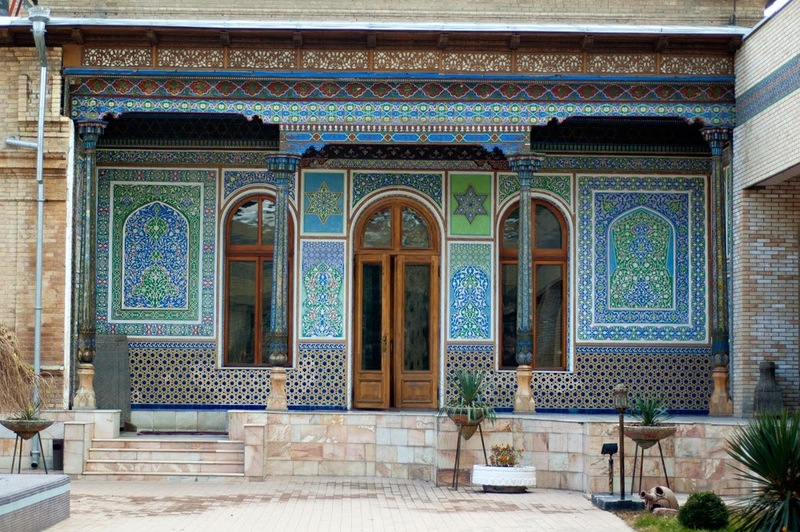 We did not have too much time, so we went to a smaller one close to our place - Museum of Applied Arts of Uzbekistan. We went by metro and then walked for ten minutes, and here we are! The Museum is located in this old beautiful building: this was a house built in the end of XIX century for a Russian diplomat Polovtsev who loved Asian culture. The museum is like a small palace or a jewelry box. Or both. 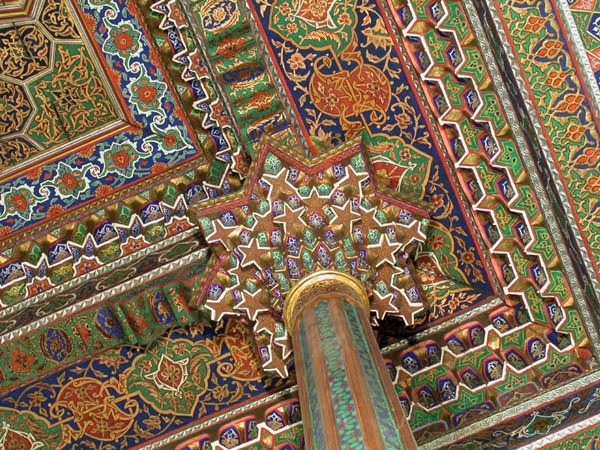 Look at this lavishly decorated facade with carved wood columns and lots of hand painting. Inside, there is a lot of carved alabaster and paintings. 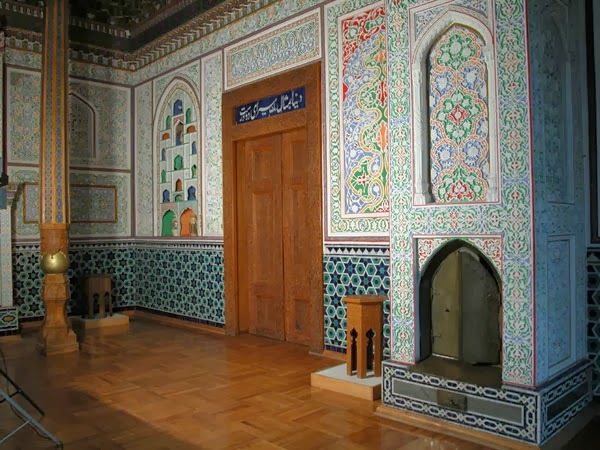 You can see the wall niches with vases and bowls: this is what they used as shelves and cabinets in Uzbekistan a hundred years before and earlier. The ceiling in the hall is just amazing. Collection of arts and crafts is not very large, but the items are beautiful. I especially love glass and china. 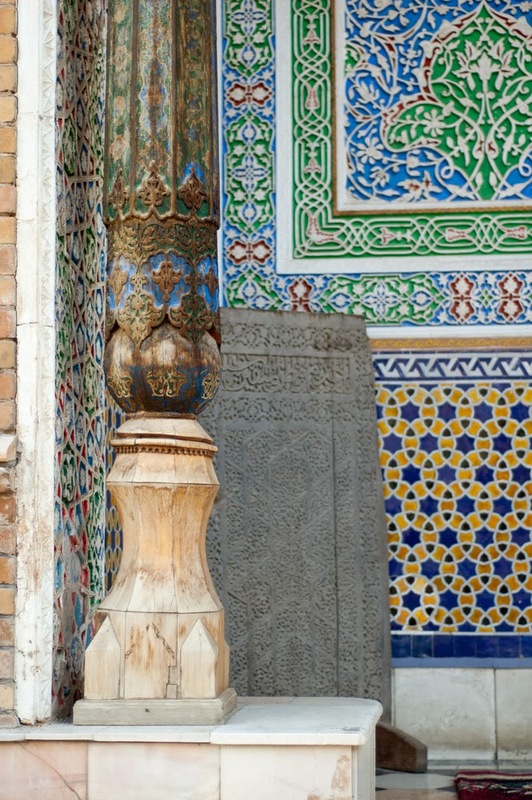 The pieces below are from the last century, so they are quite modern, coming from our Tashkent glass and china factories. 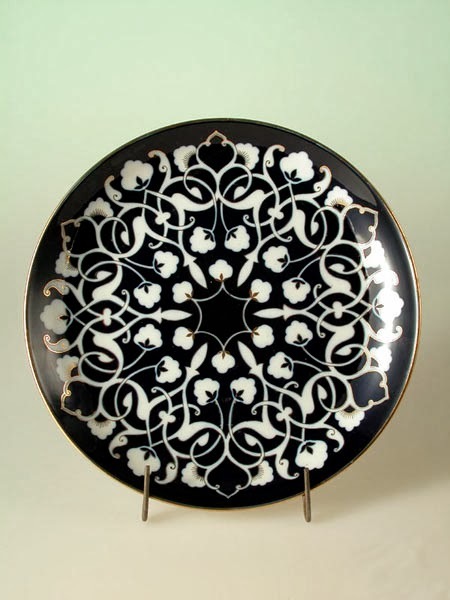 The faience dish with stylized cotton is by Alimov, 1970. 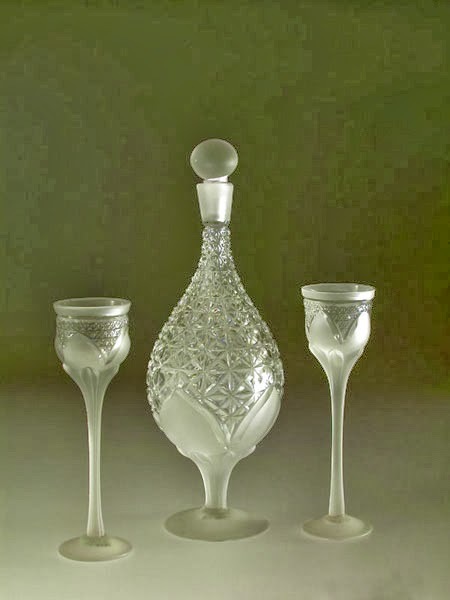 The cut glass decanter with glasses are called 'Uzbekistan' and made by Zabudskaya in 1985. 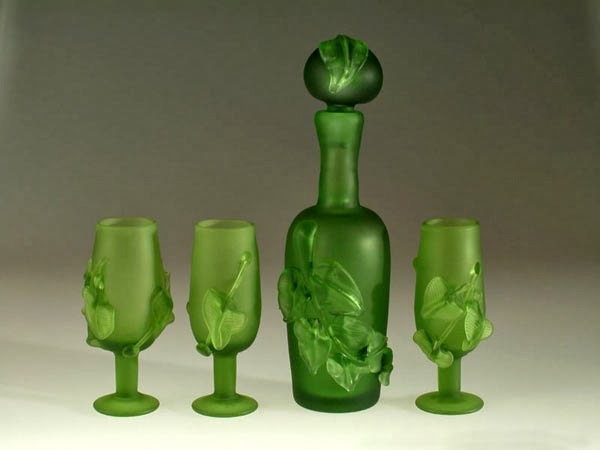 And this green glass set is called 'Dacha' (Country Home) and made by Dudin in 1983 in Tashkent. 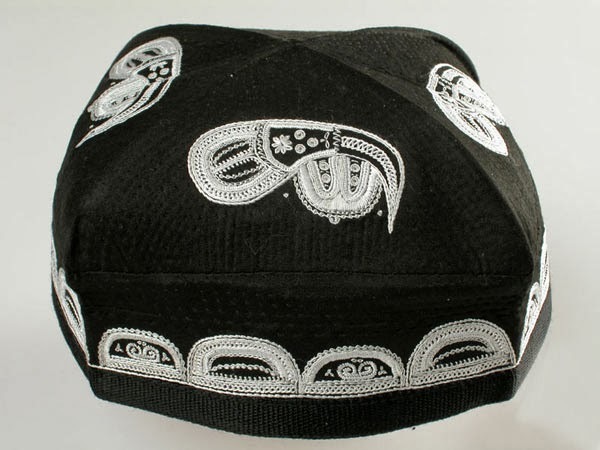 Embroidery is of course an older and more traditional art for Uzbekistan, and this museum has beautiful samples. 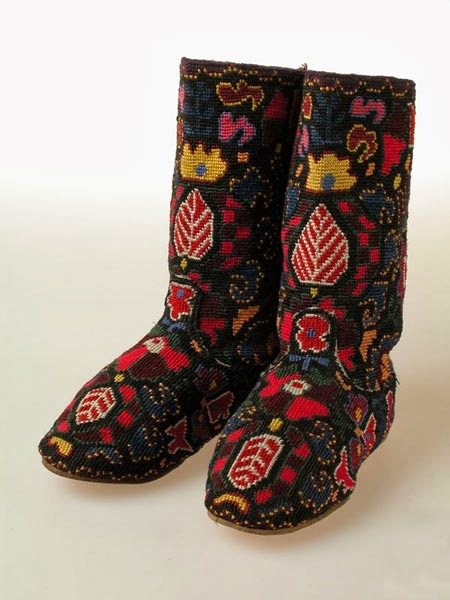 The all-embroidered boots are from Shakhrisabz, and the lovely Suzani is from Samarkand, end of 19th century. 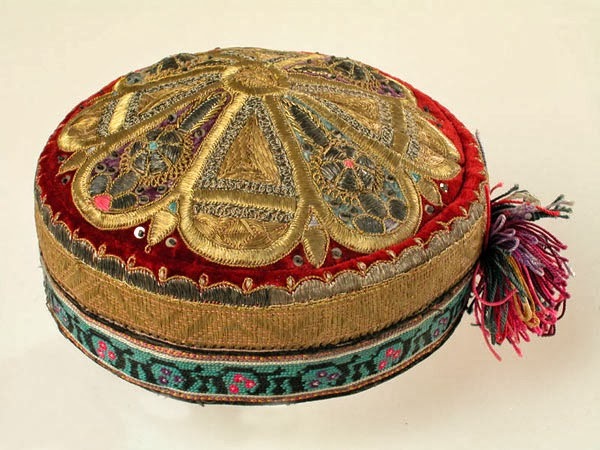 And these are traditional embroidered hats. 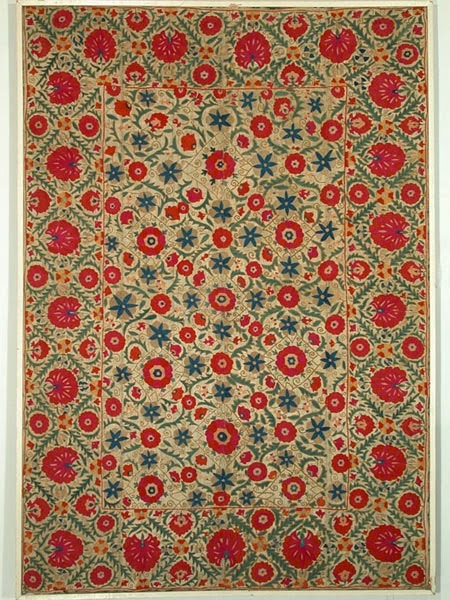 This one is of course for a woman and comes from Bukhara, 1940s. 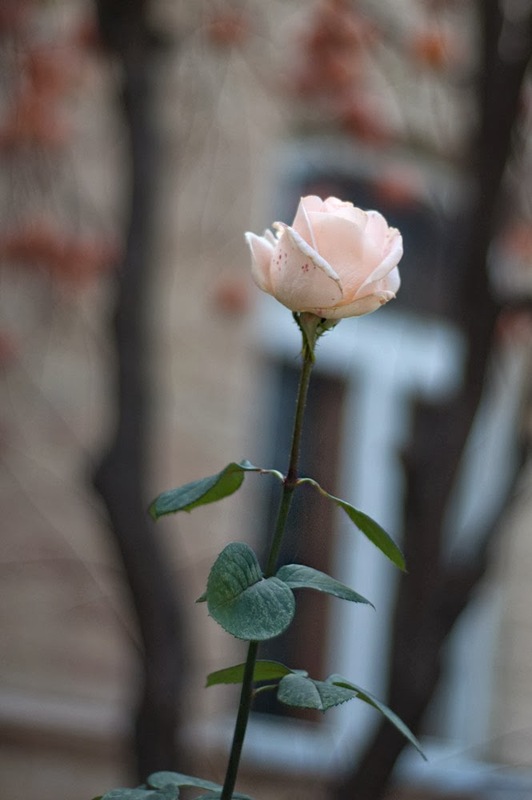 And this one is for a man. Chust or Marghilan, 1980s. Of course there is also a room for clothing. 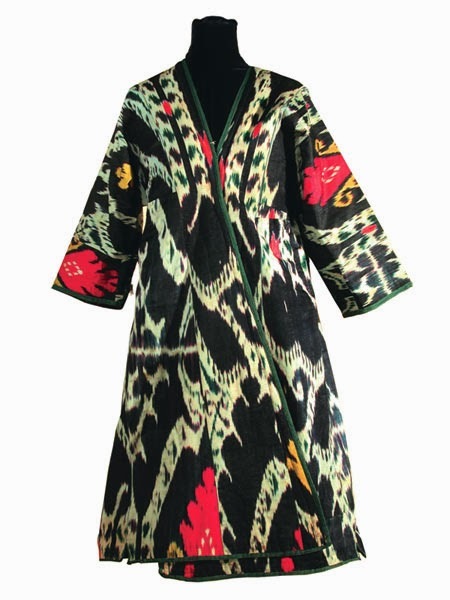 Vintage dresses and gowns from silk and cotton fabrics with ikat patterns or stripes are beautiful and eye-catching. 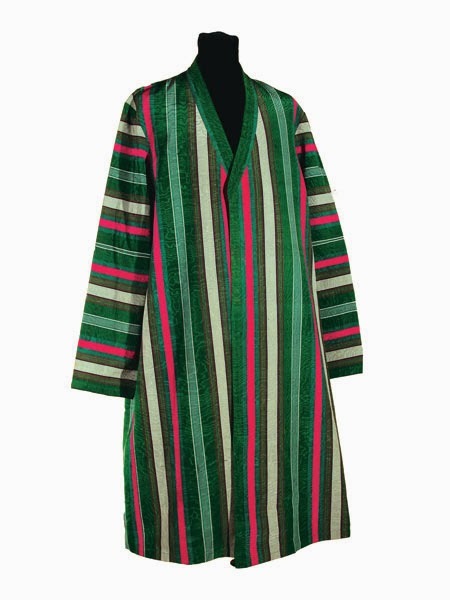 The striped gown is for a man; it is from Ferghana, 1960s. 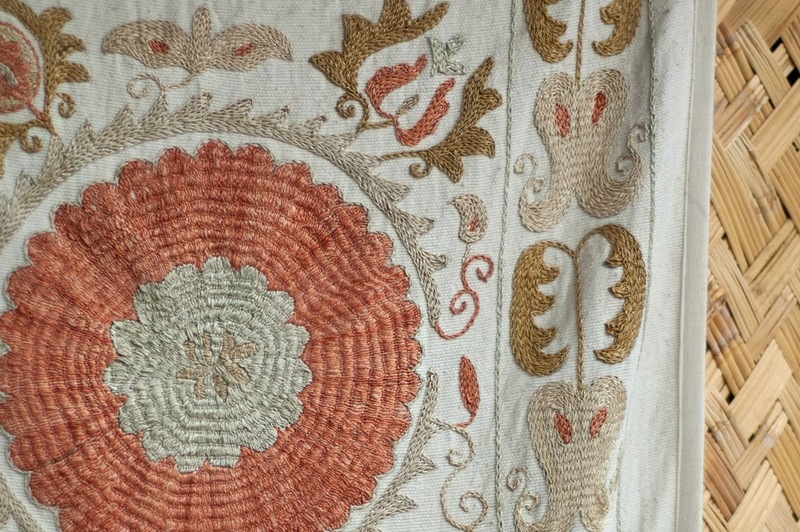 This fabric is called 'bekasab'. 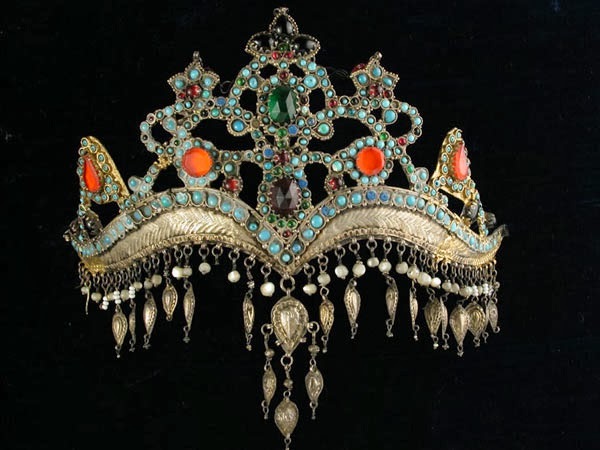 The second gown is for a woman and it comes from Tashkent, second half of the last century. There are also rugs and carpets, which are very important for the people here. 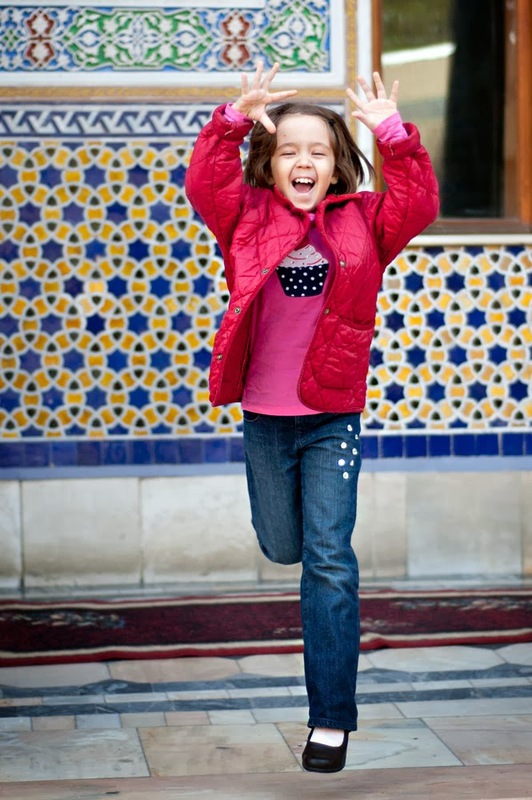 Uzbek houses are full of rugs; a rug is the best gift, they believe, and will always find room for another rug. 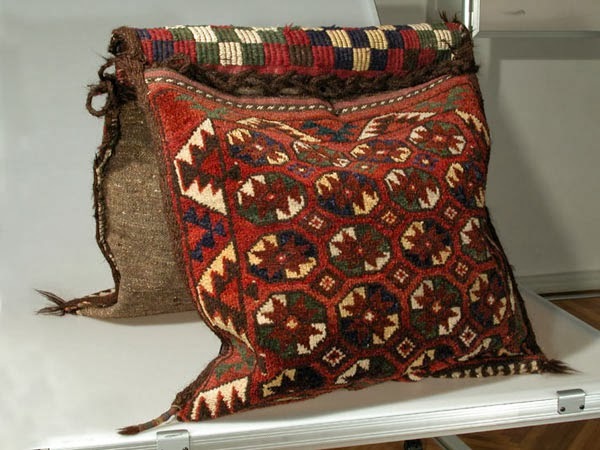 Many household items were made from rugs, for instance these saddlebags, as this is a strong and practical material. Another favorite room of mine is the one with jewelry. 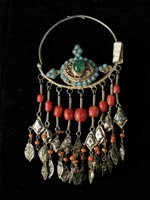 It was mostly made from silver with corals, turquoise, carnelian, tourmalines and other semi-precious stones, often combined with colored glass. The first photo shows 'tillyakosh' (Gold Brows) made from silver with turqiouse, glass, enamel and pearls. 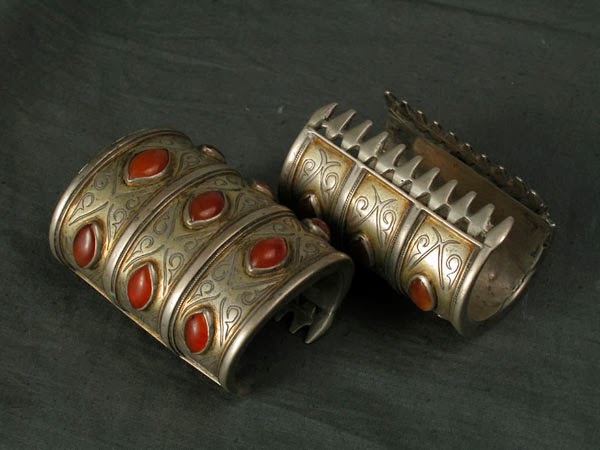 And these are very classic Turkmen (or Turkoman) bracelets with carnelian. Very heavy and barbarian looking, they still retain some gold gilt. We only spent there about an hour and a half, as Madina became tired quickly - there are too many things and colors. 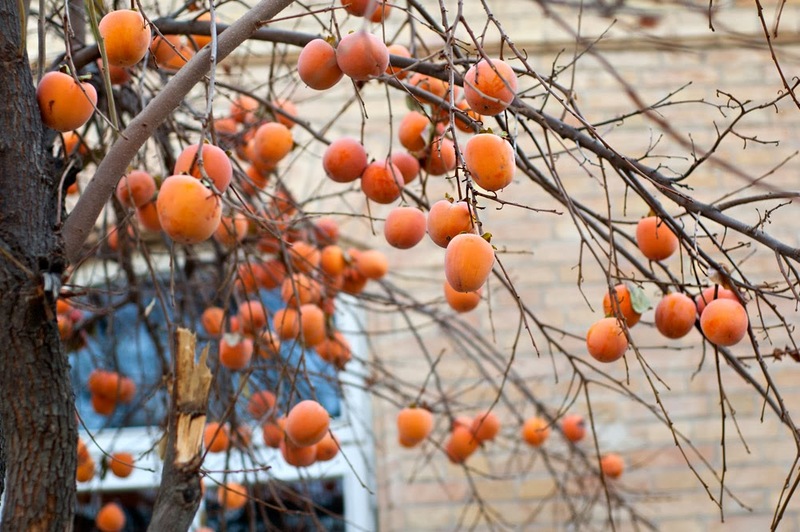 There are two amazing persimmon trees in the yard. They look very ordinary in the summer, but I find them stunning late in the autumn after they shed their leaves but still retain the fruit. 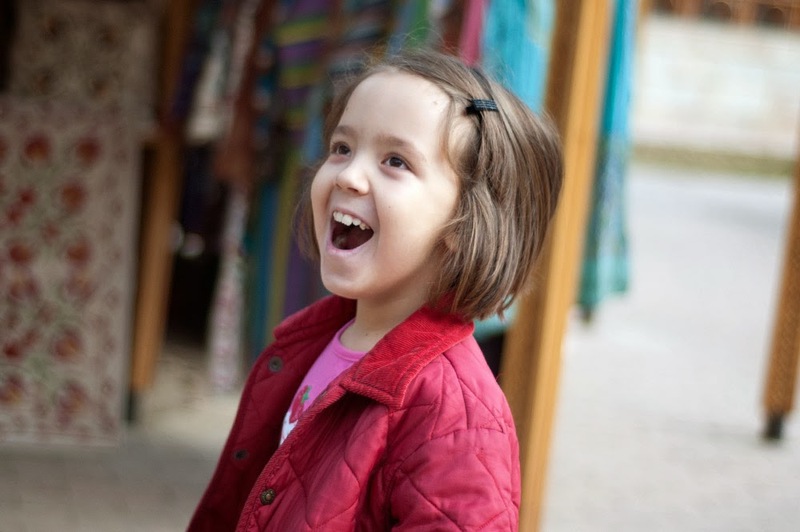 In my daughter's view, the place was great for running around, jumping and dancing. ...So we pranced around a bit and went home, discussing what we have seen and where we want to g next. It was a good beginning of a good day. Love those hats and embroidered boots.